I’m currently in the middle of my very first Whole30 challenge and so far I’m finding variety in foods, recipes, and flavors is the key to staying on track. You’ve got to mix things up to keep those taste buds happy! 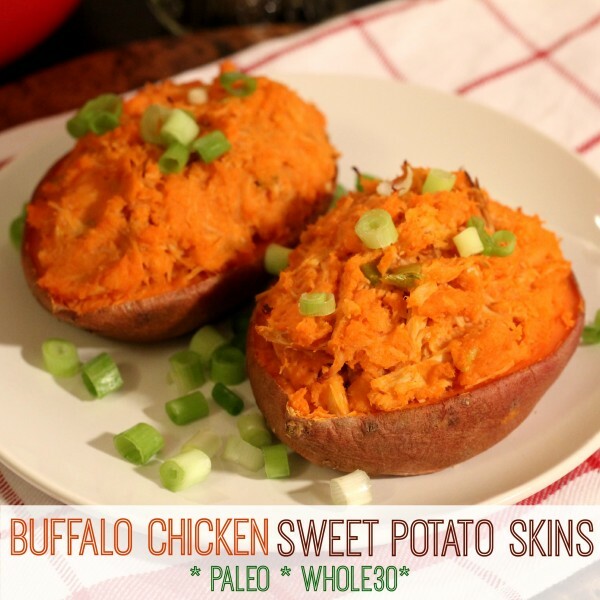 I’ve been combing through Pinterest looking for fresh, new Whole30 recipe ideas and the BBQ Chicken Sweet Potato Skins from Our Paleo Life caught my eye. I was curious about doing sweet potatoes twice-baked, “skin” style, but wasn’t as turned on by the BBQ and am trying to ration my bacon. I decided to mix things up and flip that recipe into Buffalo Chicken Sweet Potato Skins and boy were my taste buds happy! Read on for the recipe! Preheat your oven to 350. Lay parchment paper on a baking sheet and bake (scrubbed) sweet potatoes for an hour (until tender). Slice sweet potatoes in half and let cool for 10 mins (or until you can handle them without burning your fingerprints off – we’re detoxing here, not planning a heist). Scoop out insides of the sweet potato and place in a large bowl, leaving some potato flesh on the skins for stability. Mash the scooped out flesh. Drizzle the scooped-out sweet potato skins with a little olive oil, place them back on your parchment-lined pan (skin side up) and put them back in the over for about 5 more minutes to let them crisp up a little bit. In the meantime, melt ghee (or butter for the non-Paleo eaters) in a skillet and saute scallions for a minute or two. Add shredded chicken and hot sauce and stir until warmed, then transfer to the bowl with the sweet potato flesh. Mix and mash it all together until they’re best friends. Remove skins from the oven and fill them with your sweet potato/buffalo chicken mash-up. Don’t worry if your skins won’t hold all of your mix. I filled mine up as best as I could and then plopped the remaining mix right onto my parchment lined pan, next to the skins. It’s still delicious even if it’s not living in a little orange boat, and deserves to be eaten. Place filled skins (and the little mound of filling you might have next to them) back in the oven and bake for 10-15 minutes. These Buffalo Chicken Sweet Potato Skins are hearty enough to fill you up, so there’s no need to make a side dish. They reheat very well (in the oven is best) so don’t be afraid to make up more than two and enjoy them a few times throughout your week! Lastly, this recipe calls for cooked, shredded chicken so I have to share this: If you aren’t already doing so, I urge you to stockpile your freezer with shredded chicken using my “bulk prep and freeze” tip (#9). It’s a huge time-saver, and especially helpful when you’re doing something like Whole30 and trying to stay on track! Check out my first week’s worth of Whole30 meals and recipes, and stay tuned for more coming soon! You can also follow along on Instagram and Facebook to catch my daily posts. what kind of hot sauce did you use? these sound delicious. Thank you, Sarah! I used Frank’s hot sauce for them. Have you ever tried Sriracha? Sriracha and sweet potatoes together are out of this world. Great idea, Jill – I’m happy to do a tutorial on that. In the meantime, here’s literally all I do…I buy the two pack of whole organic chickens from Costco. Take the plastic off of one, remove the little baggie inside with the chicken pieces in it, rinse it inside and out, and then place it in a crock pot. Put lid on crock pot and cook on low for 8 hours. No water or seasonings needed! After 8 hours the chicken is so tender it’ll fall right off the bone.